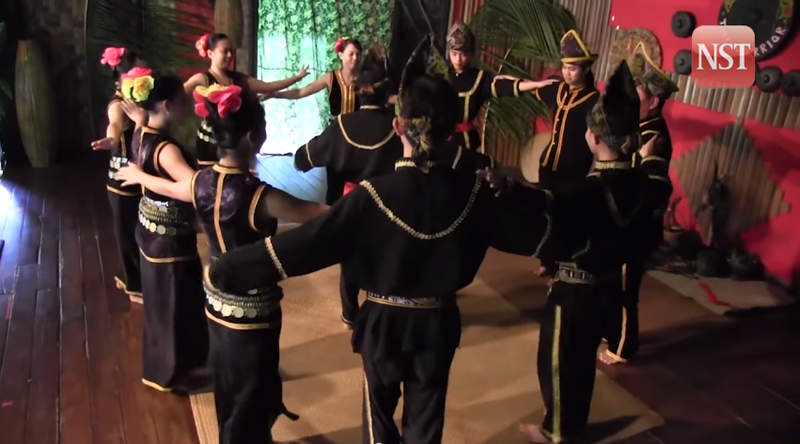 May, in Sabah, is the month of Kaamatan (Harvest Festival). 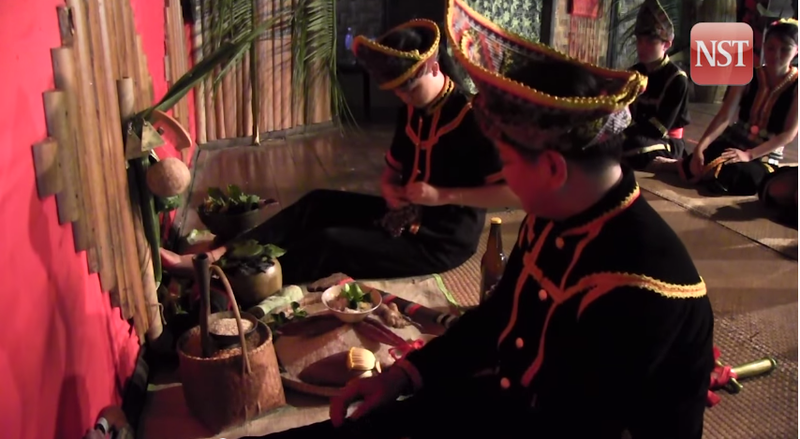 In 2013, my colleagues and I did an assignment on Magavau ceremony. We travelled to Penampang district and spoke to a bobohizan apprentice (whom, I was recently told, has become a full time Kadazandusun high priest). 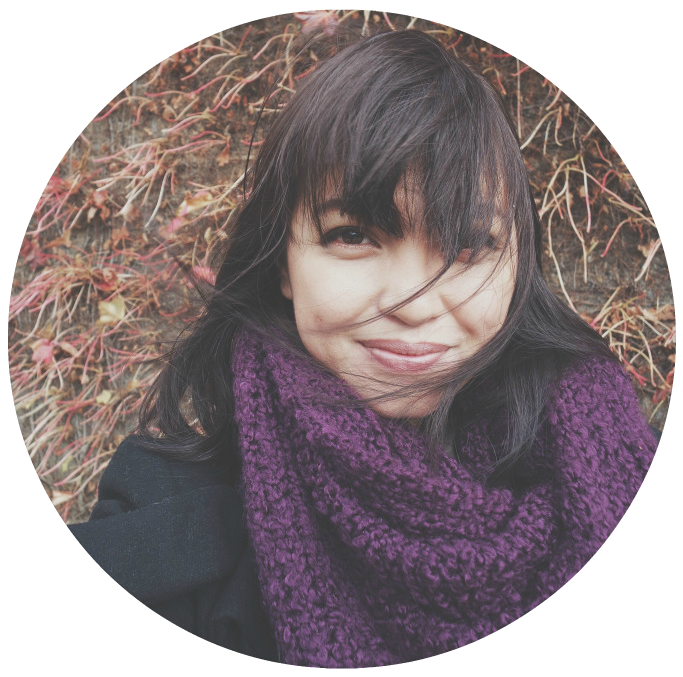 I did the interview. The write-up is done by my senior colleague Siti Nurbaiyah Nadzmi. INTO a string of jagged wooden beads, Adam Michael Gontusan whispers an ancient chant to beckon the rice spirit, Bambazon, to sit with him. The sound of the kulintangan brass gong ensemble reverberates in the background. Photographer Edmund Samunting, who is filming Adam chanting at close range, switches off the camera. Even in broad daylight, the Magavau ceremony to appease the rice spirit, can send a chill down the spine in those nearby. Preparing to perform the Magavau ceremony. Unbidden, we move aside — as if to make space for the Bambazon to “sit” next to Adam who takes out a wooden comb and gently sweeps it over the palm fronds. He later explains that the palm fronds are the hair of the Bambazon and that the spirit likes having her hair groomed. Performed during the annual Kamaatan Festival in May, the Magavau ritual is deeply rooted in the Kadazandusun folklore of Huminodun, a celestial princess who was sacrificed to ensure the survival of the tribe during a long drought season. 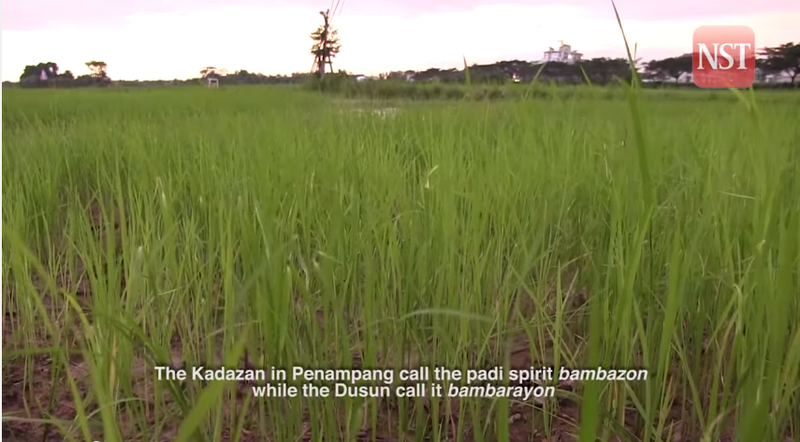 Long, long ago, says Adam, the Kadazandusun people were ruled by the god Kinoingan and his wife Suminundu. They had a daughter, Huminodun, and the three lived among the Kadazandusun people here on earth. “Huminodun had beautiful long hair,” says Adam. One day the drought came. Food became scarce and animals died. The villagers suffered and Kinoingan was baffled. But beautiful Huminodun pleaded with her father to sacrifice her for the sake of the people. But for Suminundu, the loss of her daughter was unbearable. For months she mourned until one day Huminodun returned in the form of a white smoke or Bambazon, the rice spirit. She consoled her grieving mother and asked Suminundu to perform a Magavau ceremony in her memory. “Huminodun taught her mother a long verse, what we now know as inait. This is recited during Magavau,” explains Adam. The inait is passed down from one generation to another and the keeper of the verse is the bobohizan or village witch doctor. Adam says the word magavau means “to recover”. While working in the paddy fields, farmers may have unintentionally hurt the Bambazon with their tools, causing it to hide so Magavau is the ritual to heal and call on Bambazon to return and protect the crop. The ritual can be held in a house or an open area, after dusk or during the day. “Anyone who knows the inait can follow the chanting, but only a bobohizan can lead the ritual,” says Adam. 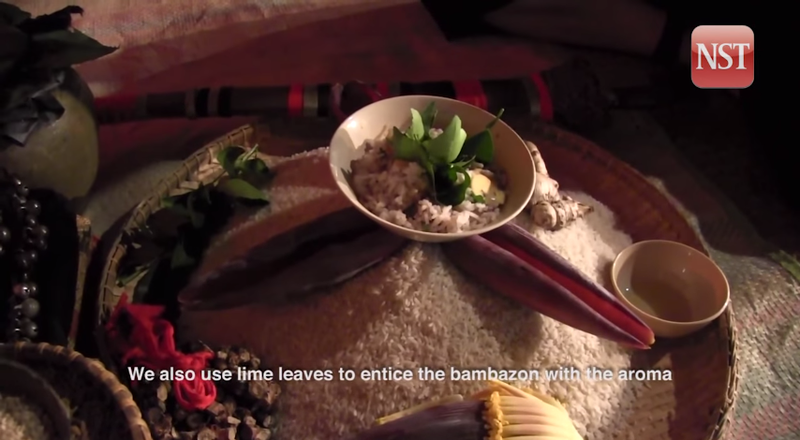 For the ritual, a bobohizan must prepare lihing (rice wine), hamak (a bowl of rice mixed with salted fish and lime), seven types of leaves bunched together and a basin of rain water. To communicate with the spirits, a bobohizan uses kumboungoh (a bunch of beads made of root) and sindavang (triangular brass pieces tied together and used like castanets). She will whisper into the kumbuongoh and rattle the sindavang rhythmically. Magavau begins with momihin, where the bobohizan speaks to spirits other than Bambazon, telling them of her intention to hold a Magavau. Adam says it is important not to “shock” the spirits or they will be outraged and may interrupt the Magavau ceremony. When this is done, the bobohizan presents the lihing and hamak to Bambazon, followed by the chanting of inait. Later, the villagers will join in a group dance called sumazau as a way to entertain and welcome the Bambazon. Sumazau is performed during the Magavau ceremony to entertain and welcome the rice spirits. Every four or five years, an additional ceremony called Humabot is performed with Magavau. For this ceremony, a bobohizan has to ferment rice in an earthenware jar for a month. We are at the Monsopiad Cultural Village, Kampung Kuai Kandazon, Penampang Kota Kinabalu, to watch Adam perform the Magavau and Humabot to call on the Bambazon to protect the harvested paddy in the tangkob (grain silo). The Magavau has three stages. The first stage, magagandai, sees Adam and an apprentice bobohizan chanting verses from the inait. In the second stage, magambai, the two lead the train of sumazau dancers who hold on to the shoulder of the person in front. The leading bobohizan holds an unsheathed sword. The third stage is called mengizak, during which the bobohizan and the villagers cry out to the Bambazon, asking her to stay at the tangkob and protect the harvest. 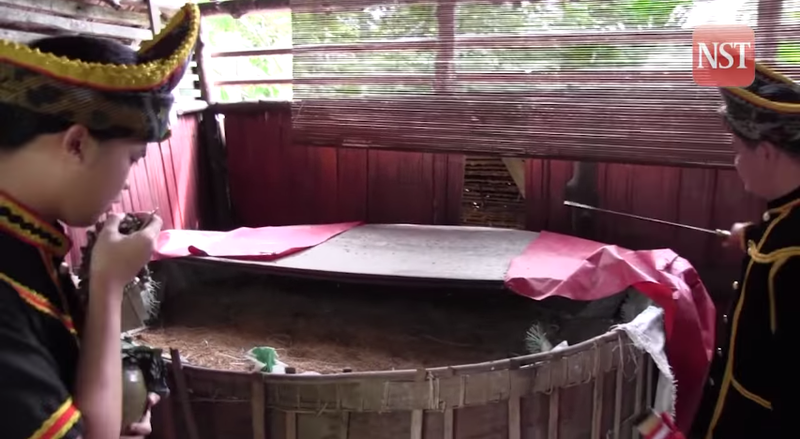 A tangkob (grain silo) where rice are kept. During the ritual, the bobohizan also takes the jar of fermented rice, or habot, to the tangkob. Here, while chanting the inait and dancing sumazau he will fling the rice at the tangkob. Adam says the ritual may sound exotic to us but this is what the spirits want. Unfortunately the cultural significance of Magavau is fading away with time. With the use of pesticides, chemical fertilisers and mechanisation in paddy planting today, the risk of a poor harvest is greatly reduced and this, in turn, diminishes the importance of the Magavau. The arrival of other religions too has eroded the traditional beliefs and way of life. 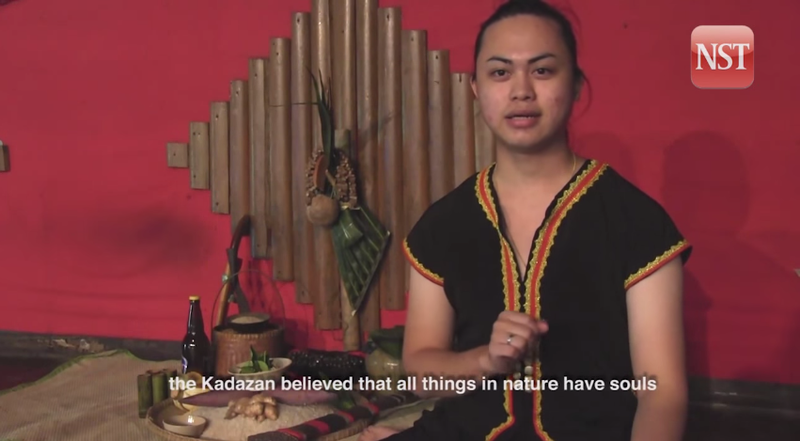 “But what is Kaamatan without magavau?” asks Adam. He believes that the festival will be incomplete and meaningless without Magavau, like “Christmas without a mass service”. “Faith is what you believe but culture is a way of life. Culture is what makes us civilised. We cannot simply forget about culture or abandon it. Bobohizan came before the arrival of other religions and we must preserve it,” he says. “Many people say that the bobohizan is feeding ghosts but that is not true. A verse from the inait says ‘you are created by God, you are needed in this world’. It is not right to condemn the bobohizan as heretic,” says Adam. The Magavau ceremony leaves us impressed with the kulintangan music and the languid moves of the sumazau dancers, not forgetting that momentary feeling of eeriness that enveloped us that afternoon. A question that lingered long after the ceremony is not about whether Bambazon exists but rather, how long will Magavau survive the tide of time?